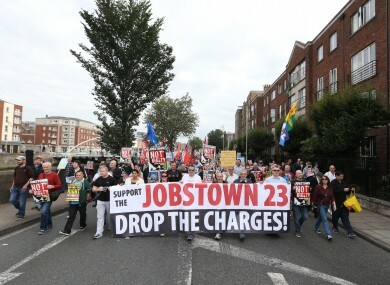 Protesters demand the dropping of charges against all the Jobstown accused. A 17-YEAR-OLD boy charged with false imprisonment of former Tánaiste Joan Burton and one of her advisors during the Jobstown protest will go on trial after he completes his Leaving Cert exams. The secondary school student is accused of falsely imprisoning the Labour leader and her political advisor Karen O’Connell during the water protest at the Fortunestown Road in Jobstown in Tallaght, Dublin, on 15 November, 2014. Gardai allege violence broke out when the Tánaiste and her entourage were trapped in a ministerial car for about three hours after they had attended a graduation ceremony. Earlier, the court heard that that in addition to CCTV evidence the State may call up to 16 witnesses and a trial date that suited witnesses needed to be agreed. The teenager,who was accompanied to court by his mother and legal team, has pleaded not guilty which means the Labour leader may have to give evidence. In an outline of the allegations given earlier, Detective Garda Paul Smith of Tallaght station told the juvenile court that the teenager was one of the main instigators. He alleged Burton could not move forward and was “very disturbed by the whole situation”. Her advisor Karen O’Connell “suffered a panic and anxiety attack in the car”, Detective Garda Smith has said. It was alleged the youth, then aged 15, prevented the free movement of the then-Tánaiste’s car and “detained her in a particular place without her consent”. It lasted for three and a half hours until gardai managed to get her moving, the court was told. Detective Garda Smith told Judge O’Connor that witnesses said that the teenager was “one of the instigators” and shouted abuse at the Tanaiste calling her a c**t. It was alleged he was using a megaphone and was trying to get people to prevent the free movement of the car. He also said that when arrested the teenager was apologetic for the distress he caused to Joan Burton. The juvenile court has heard the teen is an honours student who has a social conscience. He is involved in community and charity work, helping the homeless and the elderly, and he had received awards. It is not alleged he was involved in violence and this was different from other false imprisonment cases, his counsel has said. Five other juvenile males have been before the Children’s Court in connection with the protest. Two boys have pleaded not guilty to a violent disorder charge and one of them will face a hearing on 28 April. The younger boy, who was aged 13 at the time, is waiting to get his trial date. One youth, aged 15, who pleaded guilty to violent disorder was placed on probation for 12 months in February. Meanwhile another boy (16), who admitted the same charge, had his sentencing adjourned until later this week. Another youth is also awaiting sentence for violent disorder and smashing a window on a garda car. None of the three teens who have pleaded guilty was politically motivated but got caught up in the incident, the court has heard. Email “Trial of Jobstown protest teenager delayed because of Leaving Cert ”. Feedback on “Trial of Jobstown protest teenager delayed because of Leaving Cert ”.